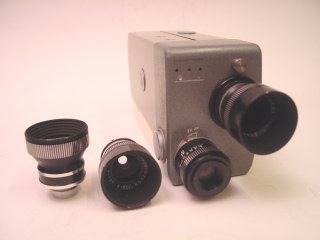 Produced in 1960, this movie camera was equipped with a lens Dygon 1:2,0 da 15mm and a lens Weitwinkelvorsatz 1:2,0 da 9mm. Its weight is kg. 0,950 and its measures are the following: 56x80x203mm. It works with a electric motor (batteries). This machine is very compact, easy to handle, and not much heavy.